I build large, site-specific installations out of low-end consumer goods. These works often revolve around the theme of nature. They involve hands-on manipulation of such minutia as pipe cleaners, whiffle balls, plastic ware, buttons and string. I use old-fashioned crafts of knitting, knotting and twisting to thread these mass market items to make more durable forms. The dichotomy between my traditional methods and the factory-produced materials creates tension that is both tangible and abstract. The structures may appear delicate and tenuous, but all materials are indestructible. Walking into one of my installations is like entering a three-dimensional painting. 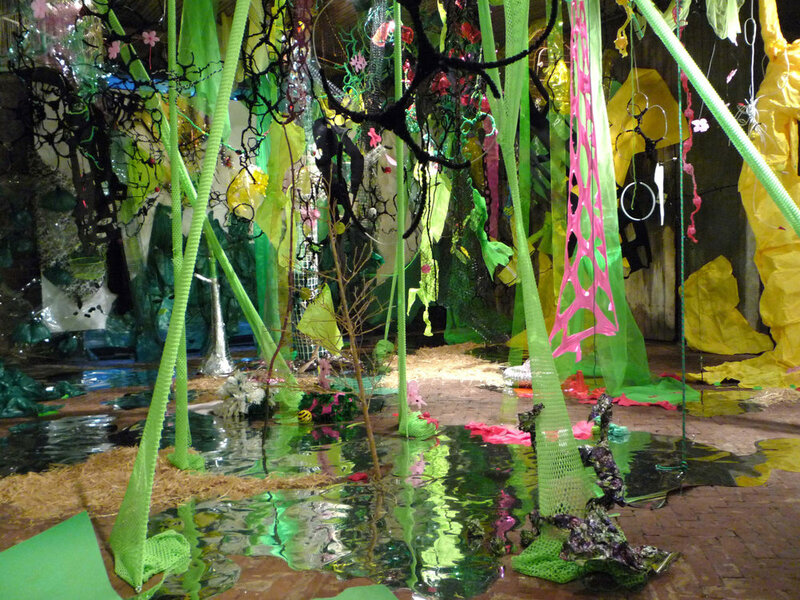 The gallery is filled with trees of transparent color, bold linear elements that sometimes vanish, and horizontal grids suspended from the ceiling out of which grows cascading refuse.